How Long Do We Have To Live In Here With Uncle Dan? 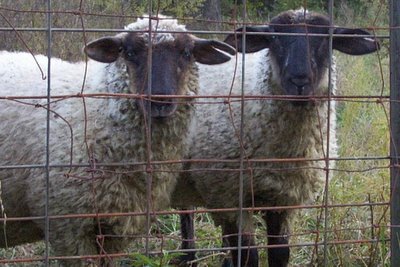 FFG-I had to laugh about the story of the young wethers. I especially loved the book "Getting to Know Your Donkey". I thought was sooo funny! I would like to know if there is one for sheep too. I am so happy that Dan has company now and Uncle Teddy is back where he belongs. Have you thought about writing a children's book about Uncle Teddy and Dan? I think that would make a great book for the children of farmers. I guess you could add that to the "Farm To Do" list. Sorry that you have no been able to leave comments on the blog. I have no idea why you can't. And worse than that, I don't know how to correct it either. It's not a member's only thing so I really don't have a clue. Muffins: I got more than 18 from the batch. Either my tin was small than yours or I got carried away with how many pecans I added. I love nuts and the more there are the better!! I split the batch in half and froze some. We have eaten the fresh ones and now I am beating off the hubby from the frozen ones. I really need to bake more! What a cute photograph of these two sheep. The ears are alert for some new development. Will they have to stay with Dan for another day? is that Becks & Posh?? or dan is such a good company?